Please donate through our Pay Pal account. 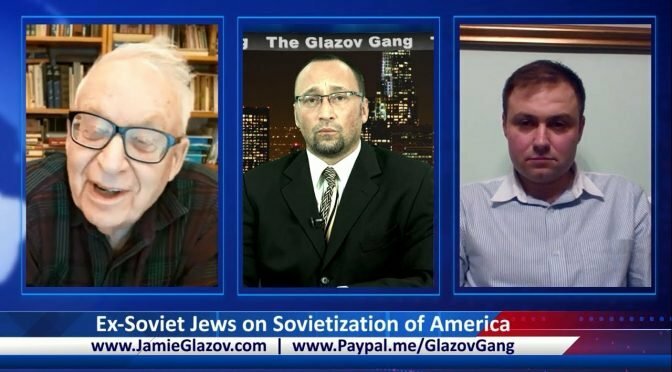 This new Glazov Gang features Igor Melcuk, a scientist and “reluctant” Soviet dissident, and Ilya Feoktistov, Executive Director of Americans for Peace and Tolerance. Igor and Ilya discuss The Sovietization of America, unveiling how the totalitarian virus has come to the U.S.A.
And make sure to watch The Glazov Gang’s 2-Part Series featuring John Guandolo, an ex-FBI agent and president of Understanding the Threat, and Brad Johnson, a former CIA Station Chief and president of Americans for Intelligence Reform. In Part I, John and Brad expose The Real John Brennan, revealing The Traitor that the Ex-CIA Director Really Was and Is. In Part II, they focus on The Terror Threat Post-Mid-Terms, unveiling The Consequences for U.S. National Security. Part I: The Real John Brennan. Part II: The Terror Threat Post-Mid-Terms. As Jamie’s video reveals above, The Glazov Gang is extremely excited to announce Jamie’s new BLOCKBUSTER book: Jihadist Psychopath: How He Is Charming, Seducing, and Devouring Us. Jihadist Psychopath, which is Amazon’s #1 New Release in the “Medical Mental Illness” category, offers an original and ground-breaking perspective on the terror war. Like no other work, it unveils the world of psychopathy and reveals, step by step, how Islamic Supremacists are duplicating the sinister methodology of psychopaths who routinely charm, seduce, capture, and devour their prey. Jihadist Psychopath unveils how every element of the formula by which the psychopath subjugates his victim is used by the Islamic Supremacist to ensnare and subjugate non-Muslims. And in the same way that the victim of the psychopath is complicit in his own destruction, so too Western civilization is now embracing and enabling its own conquest and consumption. Hard as it is to believe, many in the West simply will not take the time and trouble to understand the threat posed by radical Islamicist terrorism. James Burnham once wrote of a similar problem with international Communism in his masterful Suicide of the West. Now, Jamie Glazov has written this century’s counterpart to Burnham’s classic work and will doubtless upset those determined not to analyze for themselves the nature of the underlying phenomenon. With a Foreword written by Michael Ledeen, glowing advance praise also comes from Dennis Prager, Geert Wilders, Robert Spencer, Steve Emerson and many other titans and scholars in the international arena. (See Amazon page for many of the blurbs). And that’s why you have to pre-order a copy now. Order Jihadist Psychopath Today!